This image was taken with a fisheye lens and covers a huge expanse of sky. The dark corners at the bottom are the Eastern horizon. The red upper right corner is the dew shield of a telescope. The Milky Way stretches from Cassiopeia at the left through Canis Major at the right. Polaris is the star at center left edge. Just to the right and above Polaris is a short diagonal trail from the flare of satellite Iridium 65. This flare was magnitude -8 at 05:01:27 local time and was centered at our location. The flare was due to sunlight reflecting off the solar panels, lasting for a few seconds. It was at a height of about 778 kilometers. 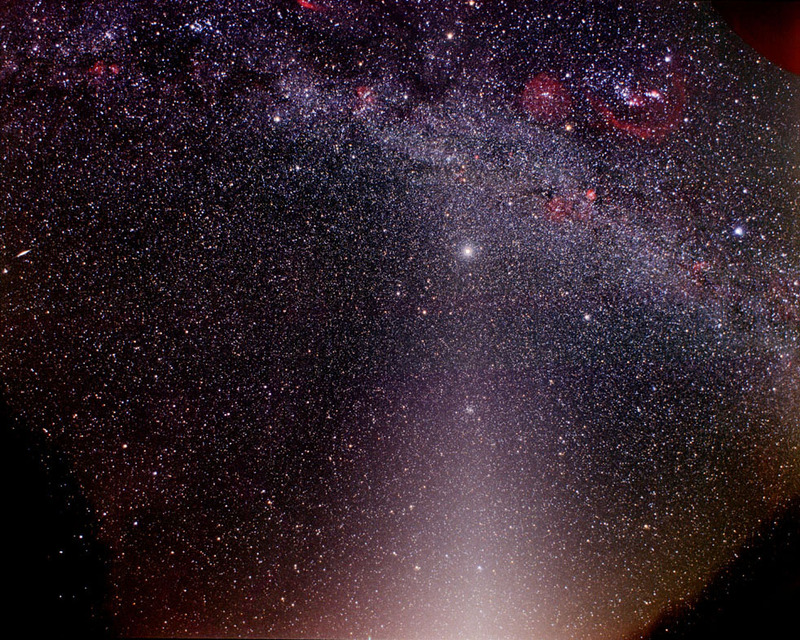 The bright patch at the bottom is zodiacal light, which is sunlight reflected off dust near the plane of the inner solar system (i.e. ecliptic). The constellation Leo is in the same area. The zodiacal band can be seen stretching vertically across the middle of the frame, encompassing the planets Jupiter and Saturn, and the constellations Cancer, Gemini and Taurus. Red nebulae visible include IC 2177, M42, Horsehead, Barnard's Loop, North Orion Bubble, Rosette, Cone, Flaming Star, California, and Heart & Soul.